Jacqueline Davies, an author, came to Chickering School to work with the fifth grade students. 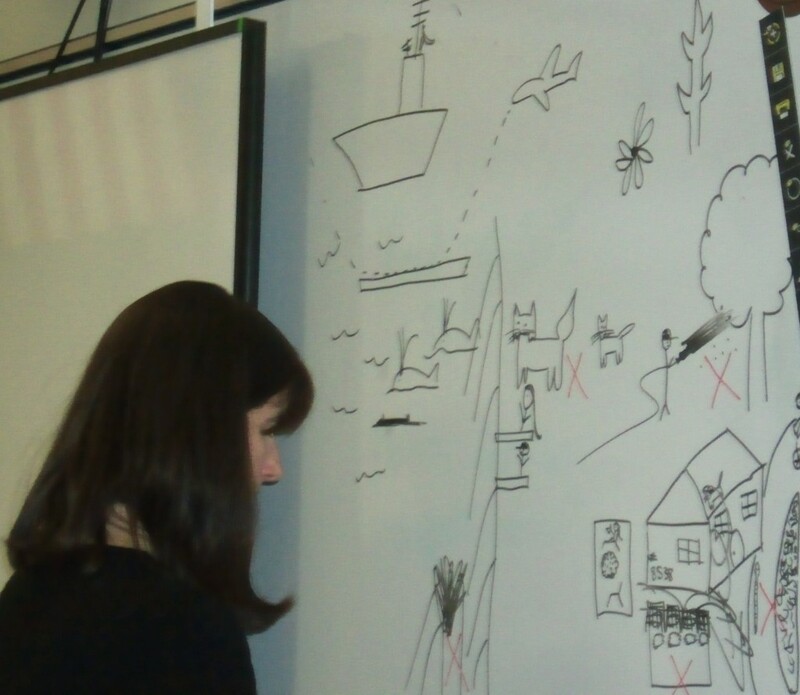 She worked with each of the 5 classrooms during her 4-day Author Residence. There are five items, she explained, which can be included in our stories: humor, mystery, dialogue, voice, and conflict/action. She shared some strategies to assist us with our writing. 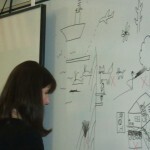 For example, draw a map of your favorite memories and circle one that you might like to write about. We appreciate the opportunity to interview Ms Davies during a lunchtime. She shared interesting answers to our questions. Please click on the link below to watch our “Chat with Jacqueline Davies”. We wish to thank Jacqueline Davies for being so generous with her time and expertise by meeting with us. Whoa! Look at those blocks switch around. How does she do it? The Respect Assemblies showed kids from Chickering School not to bully and respect each other. They used many fun activities and plays to show many types of lessons to demonstrate why you shouldn’t bully; such as teamwork and complimenting, to make someone feel better after being bullied. They didn’t just tell you to stop bullying, they acted it out so kids could laugh and enjoy learning about different ways to handle bullying. The presenters were a man and a woman who came to our school on September 25, 2012. They taught us how to respect each other in a fun way. They performed entertaining skits and acts. They also juggled to show how to work in a team and to share. They showed that complimenting people after being bullied makes them feel better. They showed us that practicing helps you get better at things that need improvement. What made this assembly enjoyable is that they didn’t just give a speech and tell you not to bully, they showed you how to be kind and how it affects others. Y stands for you. E stands for everybody, and S stands for start and special and that was what the respect assemblies explained to us. In the assemblies the performers juggled blocks around. Three of the blocks had letters on them. The letters were Y, E, and, S. The lady flipped them around and did a bunch of tricks with them and eventually it came out to spell yes. That was one of the many lessons they taught us. Another thing they taught us to do was teamwork and to practice. 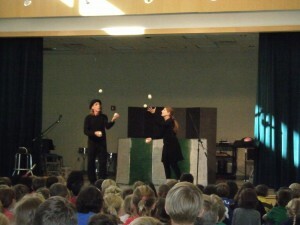 The two performers worked together and juggled to show teamwork. They did this by tossing a lot of bowling pins in the air thus showing teamwork. The man said when he was little he had trouble reading. His friend told him to read five minutes a day to get better. When he practiced reading he got better and thought to use this for juggling as well. They taught us everything from a person believing with a rope and a knot to juggling tennis rackets and skits about how people feel after being bullied. They brought up a volunteer to show how to believe and what it feels like after being bullied. They also brought up several volunteers throughout the assembly to do many different things such as balancing a peacock feather on your hand and nose. Another thing they did with a volunteer was that they had a knot to represent how you feel after being bullied, and they had the volunteer say believe and they pulled off the knot to become one. The performance included a lot of skits like the man performed the book “The Giving Tree by Shel Silverstein”. They acted it out and didn’t read the book as they went instead they already had it on a tape recording so they could focus on their acting. The lady performed a skit about how she tried out for the tennis team. She too, didn’t speak any words and had a tape recorder that spoke for her. The story was about how she couldn’t hit the tennis ball until the coach taught her and she made the team except until one day she juggled tennis rackets and became a performer and her teammates became tennis players. A woman named Mrs. Matarese was the organizer of these assemblies. A couple days before the assemblies we interviewed her. Here is some feedback we received. We asked her what the main focus was, and she replied saying its to help students be kind to each other. Also to respect the people around them. The second question we asked was the differences between the K-2 and 3-5 assemblies. She did not know much about that question. So at the assemblies we observed our selves. After watching the assemblies we realized the older grades had more of a stronger approach for jokes and skits, and also they taught the students with a more sophisticated language. Another question we asked was why did the administration decide we needed an assembly on respect. She replied saying that a parent saw this performance and thought it was an excellent example for the Chickering School. Although this show has been happening for 15 years this is the first time for the Chickering students to witness it. That was what happened during the interview with Mrs. Matarese. We learned a lot watching the respect assemblies, so we hope you learned and enjoyed our information about it. Have you ever been a new student? Do you remember how it felt? 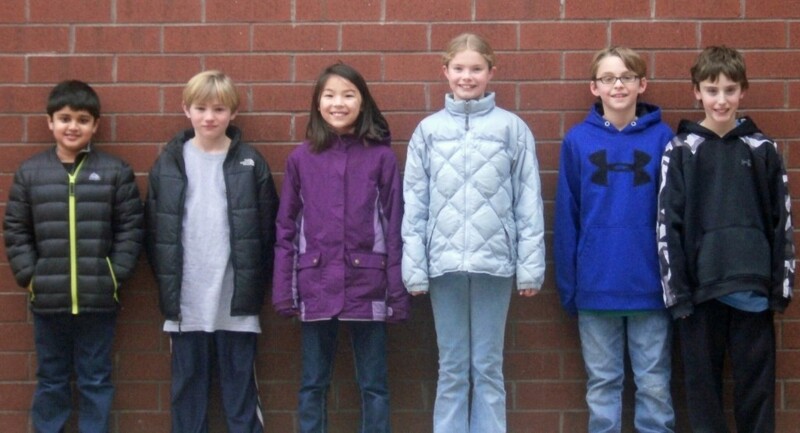 Maybe that’s how the new fifth graders felt this year. These are the new fifth graders, Garrett, Kirby, Rahul, Sophie, Clare, Christopher, and Emily. student said that the students were nicer here. 3. Art, and 4. Writing. The next question we asked people was how they were fitting in. Almost every student felt that they were fitting in well, and all of them said that that they were meeting new kids. Several students told us that their favorite subject was science, especially CSI. (Crime Scene Investigation) and Electricity units. Math was a favorite subject for a couple of students; one shared it “gets their brain working”. Two students said that they liked Social Studies and History because they like learning “about the past”. Two teachers, Mrs.Bedell-Healy and Mrs.Wasik, returned to Chickering after an absence of several years. 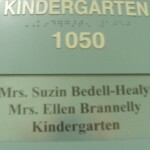 Mrs. Bedell-Healy shared a few things that have changed from the last time she was here. She said there is a new principal, and more plants are growing in the outdoor garden. She went from second grade to kindergarten. Now she has to tie more shoes, and kids are learning to read. It is probably a much more difficult grade to teach. 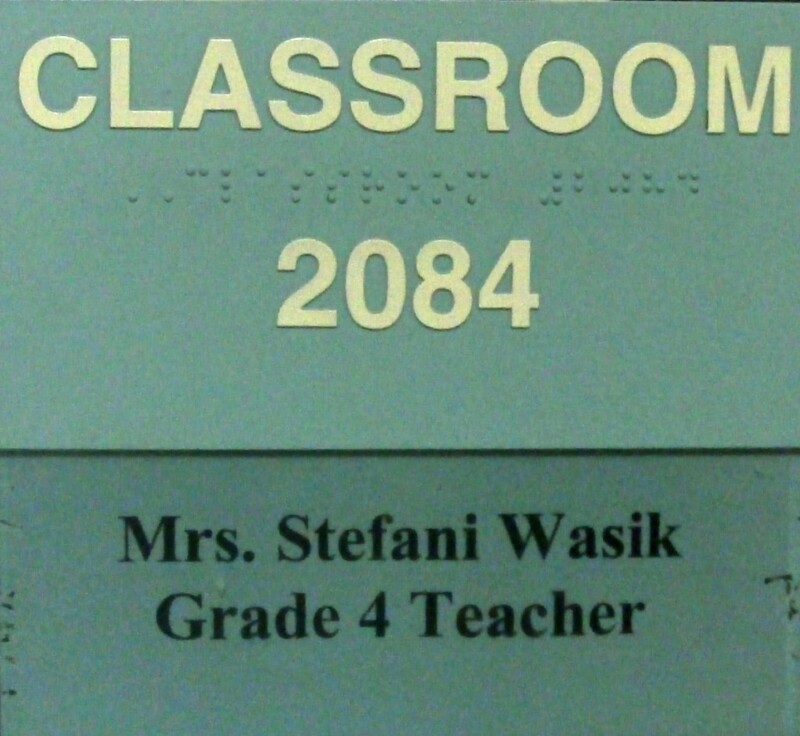 Mrs.Wasik also shared a few things since the last time she was here. 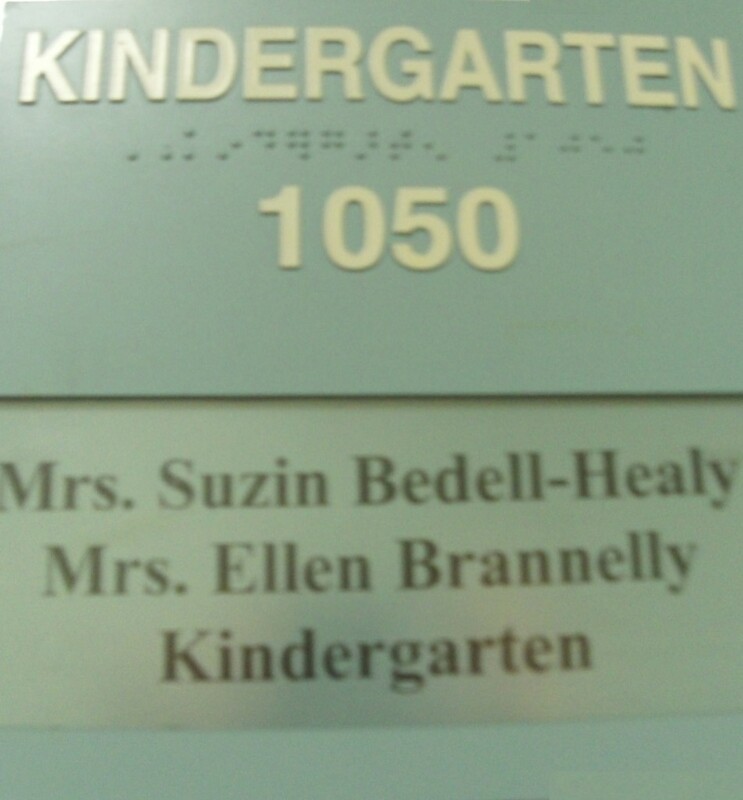 She told us that there is a new principal and she is in a new classroom. Also, there are new sets of state standards called Common Core for English Language Arts and Mathematics, which need to be taught. The last change is, she teaches a new science unit. She used to teach Oceanography, now she teaches Technology & Engineering. 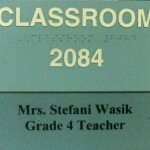 The good thing is, she still teaches 4th grade. Thank you for reading our report, we hope you enjoyed it!